As I learned on a short trip up north, winter’s snow and wind test one’s patience and fitness; lacking in both, I have less than I had hoped to show for my suffering. 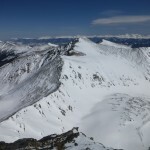 After giving up in frustration in 3-foot-deep, crusty slush below treeline near Latir, then tiring of fighting the wind on a long ridge toward Casco, I finally managed to knock off a few of Colorado’s 100 highest peaks in the Tenmile Range. The good thing about these peaks is that they have winter trailheads above 10,000′ on both sides, removing most of the need to deal with unconsolidated snow below treeline. After some time at the coffee place in Leadville, I drove past the strip mine and tailings ponds near Fremont Pass to sleep at the 10,800-foot Mayflower Gulch trailhead. 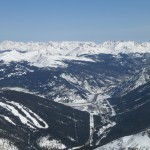 The Colorado DoT generously plows a large parking lot here, and it is a popular starting point for backcountry skiers. Expecting a cold but quiet night, I was surprised by two silently creepy encounters. First, a man and his dog in a beater car (even compared to mine!) pulled into the middle of the lot, turned off the motor, and sat around for 20-30 minutes. Then, just as I was trying to go to sleep, a large black SUV pulled in, turned around so the lights shone directly at my car, and sat with the motor running for a similar amount of time. Drug deals? I did my best “empty car” impression, and finally had peace and quiet. Dawn brought more normal visitors: a party of four snowshoers in two cars. I willed myself out of my bag, clumsily put on socks, boots, and gaiters under the steering wheel, and followed them a half-hour later up a well-packed trail. Not entirely sure about the route, I crossed the stream at a concrete penstock, following various ski tracks up the ridge to the left. 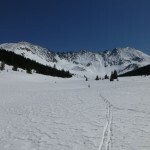 The snow in the tracks was perfect for snowshoeing, and the grind up to the ridge went easily. 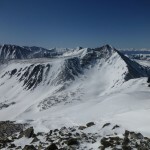 Reaching the top, I peered east toward Pacific, and north over the other side, then reluctantly wound my way a couple hundred feet down a gentler section to the valley below, where I found another ski track. The snow in the valley leading to the Pacific-Crystal saddle was more variable, and I meandered back and forth looking for the best line. 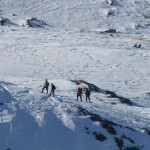 Partway up, I saw the party of four making their way around the west end of my ridge to the head of the valley. I later realized that this is the “official” route but, following it on the descent, found that the snow was better my way. I took off my snowshoes in a sunny part of the snow-rock boundary below the ridge, then picked my way up a mixture of loose talus and patchy snow. 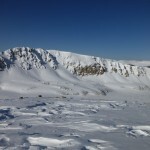 As the wind hit me near the ridge, my hands quickly froze in their sweat-soaked gloves; I ducked into a protected notch on the sunny side of the ridge to shove my hands under my jacket until they stopped aching, then donned my mitts. Though I saw bits of a use trail leading toward Crystal, it was mostly hidden by patchy snow, so I was forced to deal with the virginal talus while climbing the shaded, windy side of a subpeak. 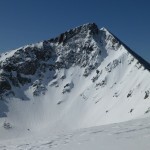 Crossing its summit, I was pleased to escape the wind and find a mostly-direct line on snow to the summit. Except in a few places, the wind-board was hard enough to hold under my snowshoes. Returning to the subpeak, I once again removed my snowshoes, and was nearly caught relieving myself by the group of four. 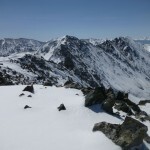 I returned to the saddle and made my way up Pacific’s north ridge over yet more wind-scoured talus. I admired the steep northwest couloir as I passed, though it is probably not yet consolidated enough to even be a snow climb. From the surprisingly calm summit, I could see 14ers from Pikes in the southeast to the Maroon Bells to the west, as well as Atlantic, my next destination. 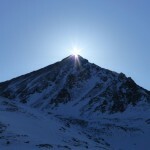 The traverse was completely uneventful, and I reached Atlantic’s summit around 12:40. This gave me plenty of time to finish off this part of the range by traversing to nearby Fletcher and Drift. 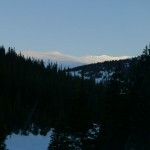 Being (Colorado) class 3-4, it would add some flavor to all the snowshoeing; however, one look at the ridge killed my motivation. 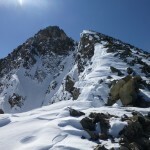 While it did not look particularly difficult or dangerous, the traverse to Drift looked like slow, wretched work over loose fins, towers, and gullies, all covered in patchy snow. I took the coward’s way, retreating down Atlantic’s west ridge until I could glissade down a moderate snowfield into the valley to the north. From there, I picked up the party of four’s tracks and followed them down to the now-crowded parking lot.